William Thomas Eardley, or Bill as he is affectionately known to all in the Blackpool Group, celebrated his 50 years membership of the Royal Arch and the magnificent achievement was enthusiastically acclaimed by the Assistant to the Provincial Grand Principals Duncan Smith when he apprised a full house of attendees in Bispham with Norbreck Chapter No 4731 of the story of Bill’s life and Masonic career. Duncan Smith (left) congratulating William ‘Bill’ Eardley on his magnificent achievement. 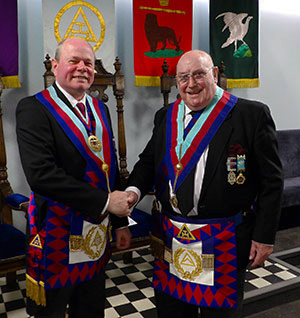 Duncan had been invested as Assistant to the Provincial Grand Principals only two weeks prior to the celebration of Bill’s 50 years and it was clear that Duncan was delighted to be presiding over the proceedings. He frequently referred to the evening as a very special occasion. Others obviously felt the same way. Grand officers Harry Cox and Terry Hudson joined Duncan for the celebration, as did Chairman of Blackpool Group John Turpin, his vice chairman David Cook and Provincial Grand Steward Juan Topping. When Provincial Deputy Grand Director of Ceremonies Neil MacSymons had placed Bill in an appropriate location in the chapter room, Duncan proceeded to outline Bill’s life experiences. Bill was born on 12 November 1932 in Blackpool – ‘a true sand grown un’ as Duncan described him. He was the youngest of seven children, although his mum and dad had a younger son some 10 years later. His father John was born and raised in Stoke and originally trained as a potter. However, during WWI he sustained terrible injuries, losing his right arm and leaving his left severely disabled. He never spoke of how he received his injuries but it was clear that, whatever the circumstances, they had a profound effect on him for the rest of his life. Bill’s mother Frances originated from Somerset and spent her formative years in service in London where she met John while he was convalescing. After getting married in 1922, the couple moved to Blackpool. Times were hard for the Eardley household, living on John’s war pension but, despite his disabilities, John always found work. He started a taxi business with his brother-in-law – even though he couldn’t drive. He sold ice cream from a pony and trap and was the first car park attendant at the Talbot Bus Station in Blackpool. Pictured from left to right, are: David Cook, Duncan Smith, Bill Eardley and John Turpin. Frances was very much the matriarch of the family, and even enduring such financial hardship, ensured that Bill had the happiest possible childhood. Bill left school at the age of 15 to begin a painting and decorating apprenticeship but, at the age of 18, was called up for National Service in the Royal Navy. While in the Royal Navy, Bill worked as a Sick Birth Attendant, developing a resistance to tuberculosis while working on the TB ward – a ward that nobody else would go near! On completion of his National Service, Bill returned to painting and decorating before setting up in business as a builder with his brother-in-law. Later, he dissolved the business and worked for BAC in Salmesbury, concluding as Senior Maintenance Officer. During his National Service he had met Audrey Millward, later to become his wife. Audrey had been a Butlin’s Beauty Queen winner and she and Bill married in 1956 when Bill was 23 years old. Audrey and Bill were very happily married for 43 years until, sadly, she died of cancer in 1999. Within a year of marriage Bill and Audrey moved to Canada where Bill worked as a sugar boiler amongst other things – well, Canada is the home of Maple syrup! Audrey’s secretarial skills had secured her a good job with a packaging company, the owner of which was Paul Maserack who became a very good friend of the family and introduced Bill into Freemasonry. Bill was initiated into Corinthian Lodge No 481 in Newmarket, near Toronto, where the Masonic hall was a magnificent building, the size of a church and in which the director of ceremonies would stand at the back shouting: “I can’t hear you”; ensuring that all the lodge members spoke up. It was a custom within the lodge to make newly initiated entered apprentices, passed fellow crafts and raised master Masons stand up at the end of the next meeting, under ‘any other business’ and say, “Worshipful Sir, I would like to prove myself a master Mason (or appropriate degree) and recite the relevant obligation – a major trial for any young Mason. Bill and Audrey lived in Canada for nearly four years and having saved enough money for a deposit on a house, returned to Blackpool. Not only did they purchase a house, they also owned their own telephone, an item which everyone in the street, according to Bill, appeared to have adopted as their own! On returning to Blackpool, Bill joined Rectitude Lodge of Blackpool No 4122 in 1967 and subsequently joined Quingenti Lodge No 8516 and Senatores Lodge of Installed Masters No 8966. He was appointed as Provincial Grand Steward in 1983 and promoted to Past Provincial Junior Grand Warden nine years later. He received his first grand rank in 1996 and now holds the very high rank of Past Junior Grand Deacon in the Craft. 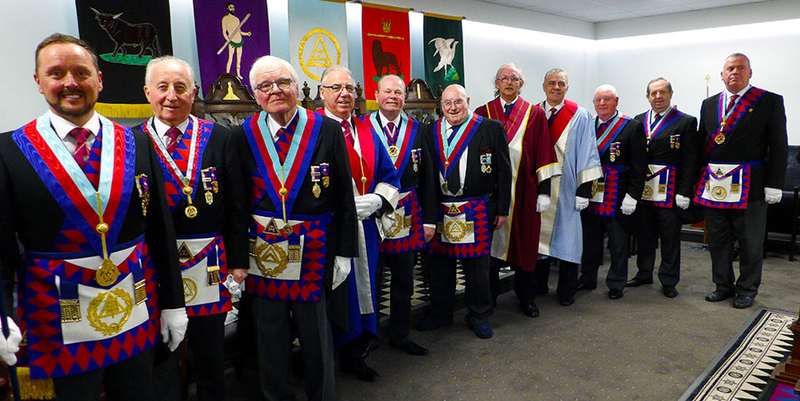 Bill’s Royal Arch journey started in 1968 when he was exalted into Bispham with Norbreck Chapter and has remained a loyal member ever since, serving all offices before being installed as first principal in November 1980. He acted as charity steward for three years, assistant director of ceremonies for six years and director of ceremonies for four years. Provincial honours were bestowed on him, firstly with the rank of Past Provincial Grand Sojourner, before being promoted to Past Provincial Grand Scribe Nehemiah in 1992. Grand rank followed with an appointment to Past Grand Standard Bearer and then promotion to his current very distinguished rank of Past Assistant Grand Sojourner, which he received in 2006. 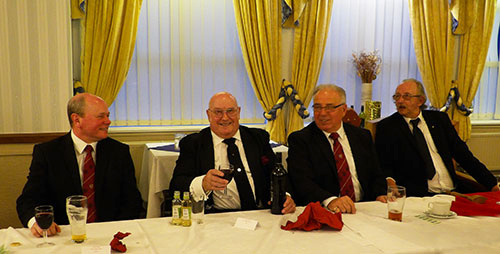 Pictured from left to right at the festive banquet, are: Duncan Smith, Bill Eardley, Colin Goodwin and Gordon McLean. He became a founder of Senatores Chapter of Installed First Principals No 8966 in 1985, becoming its first principal 10 years later. Furthermore, in 1988, Bill became a founder of Blackpool Chapter of Sincerity No 4175, for which he designed the chapter crest. His researches have not been confined to Craft and Royal Arch degrees. He is a member of three other Masonic Orders and holds grand rank in one of them. Outside of the degrees in Masonry, Bill has been, over the past 35 years, a tower of strength at Blackpool Masonic Hall, serving on the management committee before becoming the chairman of the building sub-committee for a period of 10 years, which led to his election as vice president in 1989 and subsequently as president in 1990. Perhaps the pinnacle of Bill’s Masonic career came when he was appointed Blackpool Group Chairman in 2001, a position that he enjoyed for six years, previously having been vice chairman and secretary. 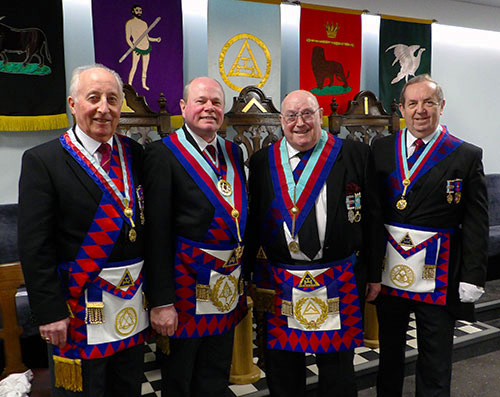 In concluding the précis of Bill’s Masonic career, Duncan emphasised Bill’s unerring encouragement of younger companions with whom he has always been able to relate and the assistance he has given to all he came into contact with. Many of those will fondly remember Bill’s renditions of the master’s and principal’s songs at the numerous installations that he has attended, particularly recollecting the humorous words of wisdom accompanying the clinking of glasses with the masters or first principals. Bringing the celebrations to a close, Chairman of Blackpool Group John Turpin read the congratulatory scroll from the Grand Superintendent Tony Harrison, prior to Duncan making the presentation and wishing Bill every happiness and the very best of health for many years to come and thanking him for the privilege of having presided over the happy occasion of Bill’s golden jubilee in Royal Arch Masonry. It had been a wonderful evening and things got even better when the happy throng sojourned to the dining suite to continue the celebrations. As one might expect when Bill is the principal guest, the festive board was a fun-packed and joyous time; elements that Bill has always generated during his 50 years in Royal Arch Masonry. Pictured from left to right, are: Neil MacSymons, David Cook, Terry Hudson, Colin Goodwin, Duncan Smith, Bill Eardley, Gordon McLean, Stephen Jelly, Harry Cox, John Turpin and Juan Topping.